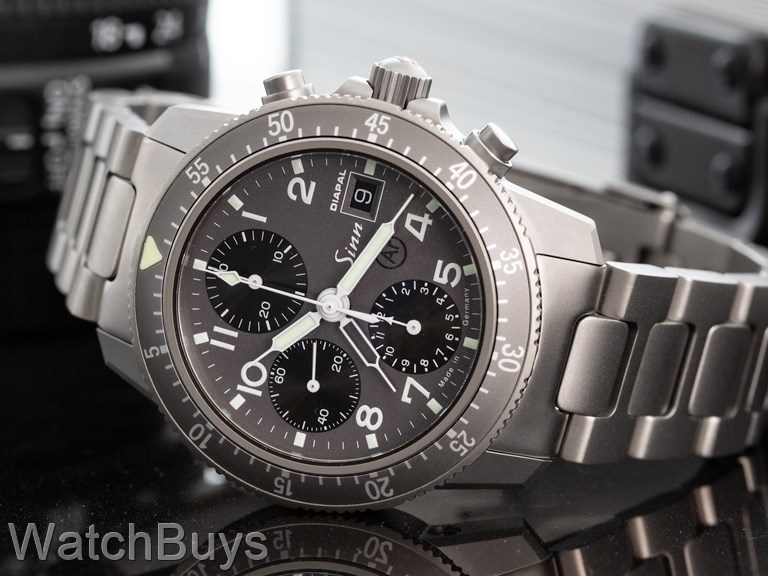 The Sinn 103 Ti DIAPAL on Bracelet takes all of the classic elements of the 103 Series of chronographs and adds Sinn's DIAPAL Technology for years of reliable use. Titanium case with sapphire back. Dial is anthracite with black sub-dials, Arabic numerals and date display at 3. We have to say this is one of the most striking dials we have ever seen on a watch. The design and layout of this watch make it extremely easy to read in virtually all light conditions. Verified Owner Comments: Great Watch. Replaced my 20 year-old Reveue Thommen Airspeed Automatic Chronograph with the Sinn 103 Ti DIAPAL. Excellent fit and finish. The titanium band and case really make for a light manageable piece. The face of the watch does look much better in person than in pictures. Numbers and hands have excellent visibility, and are nearly as readable in the dark as in the light. Classy but not overstated, stealthy and only a real watch person will notice it, but that just makes it all the better. Verified Owner Comments: My first nice mechanical watch. Have owned now for 3 years. Solid, good looking and very affordable. Verified Owner Comments: What makes this watch special is the DIAPAL feature. The 103 line are all great watches, but the DIAPAL modification makes this model more horologically interesting. I also look forward to many years of accurate service in a titanium package. It's a good looking piece without being "blingy". It's just a well made, reliable tool that can take a beating if it must. Just what I was looking for. Verified Owner Comments: The 103 TI Diapal is much more impressive in person than the pictures would indicate. A home run for Sinn and anyone who owns this watch.